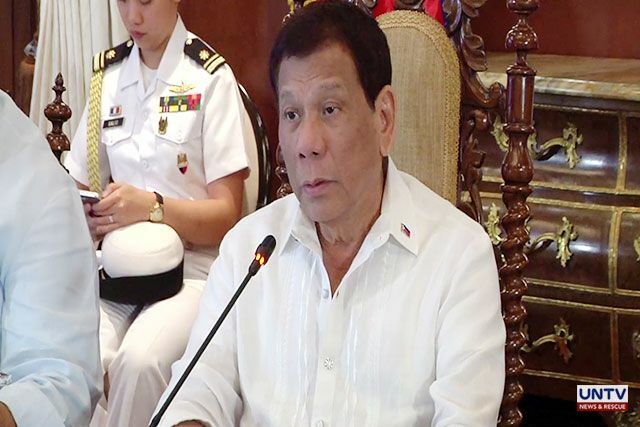 President Rodrigo Duterte on Tuesday (November 6) clarified that there was no formal designation nor appointment given to the Armed Forces of the Philippines (AFP) regarding their task to help cleanse the Bureau of Customs (BOC) of corruption. “When I called in the Army to help the Bureau of Customs, there was no designation, there was no appointment and there was never an instruction for them to take over the functions of the employee,” Duterte said. “Since I cannot investigate one per day even to determine the guilt or the innocence of everybody there, day by day, that would that would take me almost 10 years to do that. So ang ginawa ko is just really to order them on floating status. But that was a particular order directed for chiefs of offices and section chiefs. Iyong mga assistant nila ang magta-trabaho,” he explained. President Duterte came under fire after he ordered the military to man the BOC amid a series of controversy involving billions of pesos worth of smuggled shabu. Critics questioned the Chief Executive for his order citing clear provisions of the law that no active military personnel shall hold any civilian position in the government. But the President insisted that unless law and order is restored inside BOC, military presence will remain in the agency. “Until I am satisfied that law and order is established in that area, the presence of the Armed Forces of the Philippines will be there,” he said. “Pero ang ano ang inilagay ko naman diyan civilian. Ano ba namang problema ninyo? Civilian supremacy over the military. Are we talking of numbers here? That when you say that the civilian authority is supreme so that everyone of them must be civilian. Or if you put one military man there and a few technical men of the Armed Forces of the Philippines, just see to it that everything is done properly. Anong militarisation?” the President stressed. Malacanang previously clarified that government troopers are there only to observe and to extend assistance in Customs operations. The President met with some members of his Cabinet on Tuesday. Present in the meeting was former Customs Commissioner now TESDA director general Isidro Lapena.